Delivery within Malaysia is FREE of charge. For delivery outside of Malaysia (International), a surcharge will be included for the services provided. 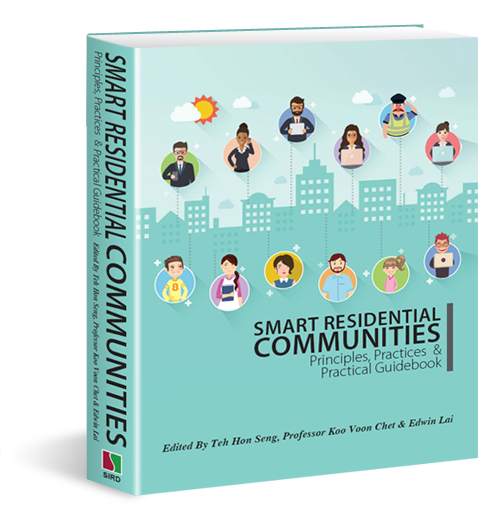 Smart Residential Communities contains 5 Parts, split into 20 Chapters, giving the comprehensive views from the basic definition of Smart Residential Community to hands-on guides, security measures, technological aspects, and its future development. Teh Hon Seng is the Group CEO of TimeTec Group of Companies. Prior to forming TimeTec, Teh led PUC Founder (MSC) Bhd to be listed on MESDAQ (ACE) market of Bursa Malaysia in 2002. 6 years after, he foresaw the trend of cloud computing and mobile technology, and over the years, he had strategically diversified and transformed its biometric focused products into a suite of cloud solutions that aimed at workforce management and security industries including smart communities that centered around the cloud ecosystem. Prof. Koo Voon Chet is currently a Professor at Multimedia University. His research interest includes remote sensing technologies, signal processing, and embedded system design. He has been a principal consultant for various government agencies and engineering firms since 2000 and published more than 100 papers in refereed journals, international conferences, 2 books, and 9 patents. Edwin Lai Yeong Chang is a Master's Degree Graduate in Applied Linguistics from Monash University. Joining TimeTec right after his graduation, he is currently embarking on his career of writing as an In-house Copywriter at TimeTec and is heavily involved in the field of copywriting, editing and proofreading within the company.